When it first arrived the 206 was a real hit, with a stylish design that couldn’t be matched by its direct rivals. The introduction of the CC model made it even more appealing, while the SW version even added a welcome dose of practicality. Think of an iconic Peugeot and chances are you’ll have a picture of a 205 in your head. And though the 206 isn’t quite as pertinent to petrolheads, it’s equally as recognisable. When it arrived in 1998 it proved to be a big hit and went on to become the firm’s best-selling model. Stylish lines and neat handling made it a sure fire hit with younger customers in particular. Initially launched as a hatchback available with three or five doors, the 206 proved a stylish but practical addition to the supermini segment. It was the arrival of the folding hardtop CC model that really shook up the establishment though, offering technology not yet seen at this price point. It soon became incredibly popular, and served as a halo model for the brand’s image. Those more interested in load lugging than posing should look towards the SW model. It may not boast the same striking design as its brothers, but the interior makes up for any visual shortcomings. With the seats in place the boot will hold 337 litres of luggage, but folded flat this increases to a much more competitive 1,258-litre space. Petrol engines range from 1.0- to 2.0-litres, all in four-cylinder layouts. Diesel buyers are well catered for with 1.4-, 1.9- and 2.0-litre units – and all prove refined and frugal. As the 205 bore such a legendary hot hatch in its GTI models, its no surprise there was a racy 206 as well, though the 175hp 206RC proved somewhat of a dynamic disappointment. Along with five- and six speed manuals, there was a four-speed automatic gearbox, though there have been some reported cases of electrical control problems with this unit so it’s probably best avoided. Peugeot has a long history of diesels, but while the 2.0 HDi offers plenty of performance, it’s the 1.4 HDi (a unit shared with Ford) that proves to be the best all rounder. It manages 4.3 litres/100km and emits only 113g/km CO2. It’s best to stick with the mid-level trim, and though fine in the hatchback, the 1.4-litre unit can struggle with the extra weight of the SW model. 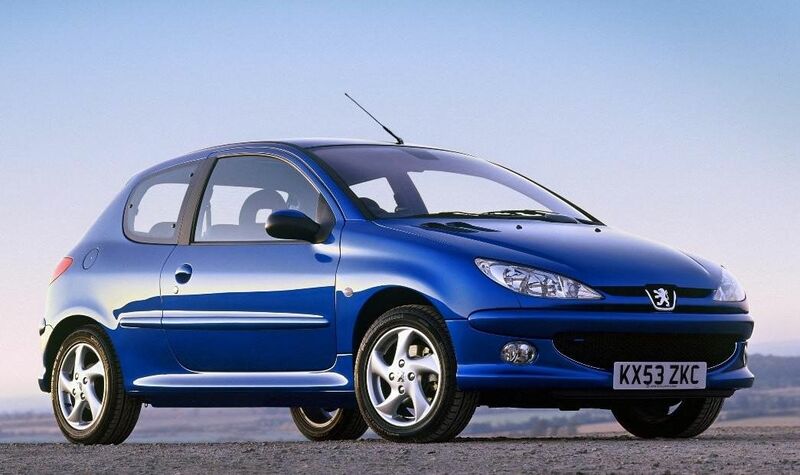 When it first arrived the 206 was a real hit, with a stylish design that couldn’t be matched by its direct rivals. The introduction of the CC model made it even more appealing, while the SW version even added a welcome dose of practicality. Along with some talented diesel engines it proved more than a match for the contemporary VW Polo or Ford Fiesta, and became one of the best-selling Peugeots of all time.